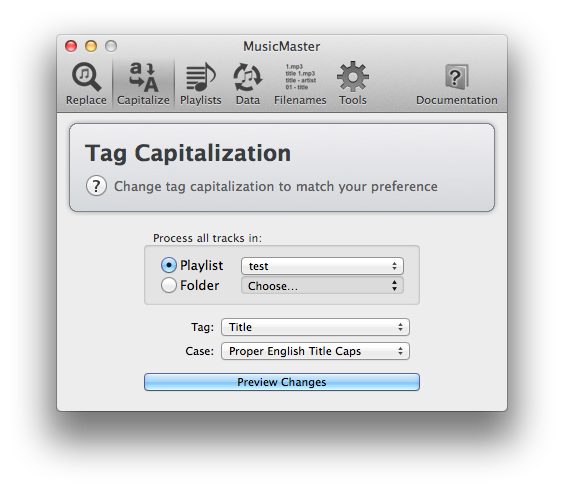 MusicMaster is an application that allows you to perform a number of useful operations on your digital music collection like changing the case of the titles, removing broken files or performing search & replace across all "tags". 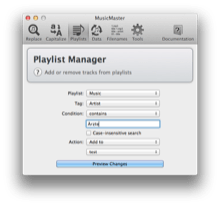 MusicMaster can operate on your whole iTunes library, on selected playlists or on folders of music (which works even without iTunes). TAG CAPITALIZATION: The "Tag Capitalization" tools allows you to change the capitalization of the titles (or other tags) of the tracks in your music collection to a number of presets, e.g. capitalize the first character in all words of the tag. 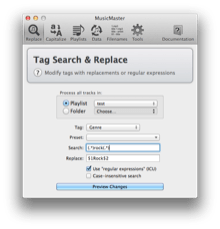 SEARCH & REPLACE: The "Search & Replace" tool allows you to perform a search & replace operation within the tags of the tracks of your music collection. For example this tool allows you to replace "Part 2" with "Part II" in the title of every track in your music collection. The tool is particularly powerful because you can also use so called "regular expressions" to perform replacements that are not possible with plain text searches. 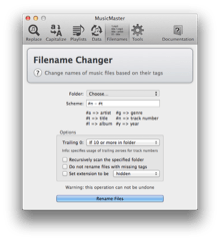 FILENAME CHANGER: This tool allows you change the actual filenames of your music files, based on the "tags" of your music files. E.g. 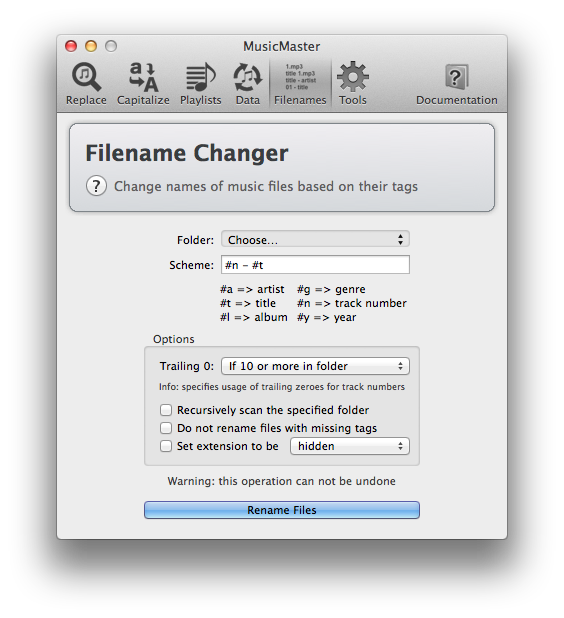 to make all files have names containing the artist and the title, separated by a hyphen. BROKEN TRACK MANAGER: "Broken tracks" (tracks with an exclamation mark next to them) are files that iTunes can no longer find or play them because they have been moved or deleted after being added to iTunes. 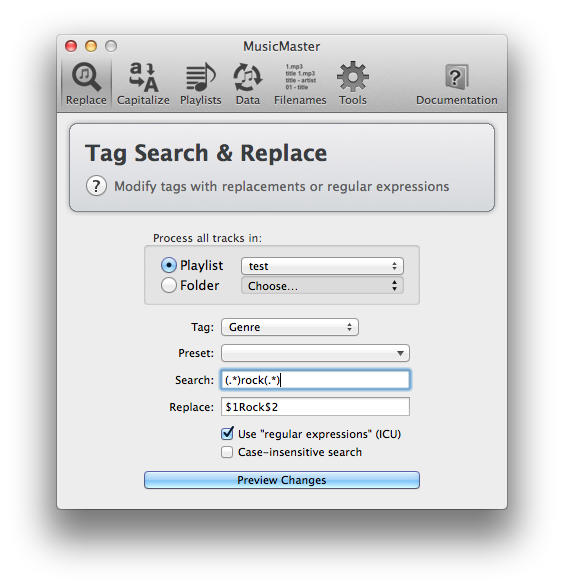 The Broken Track Manager allows you to repair these broken tracks by searching for the files (if they have been moved) or remove them from your library (if they have been deleted). 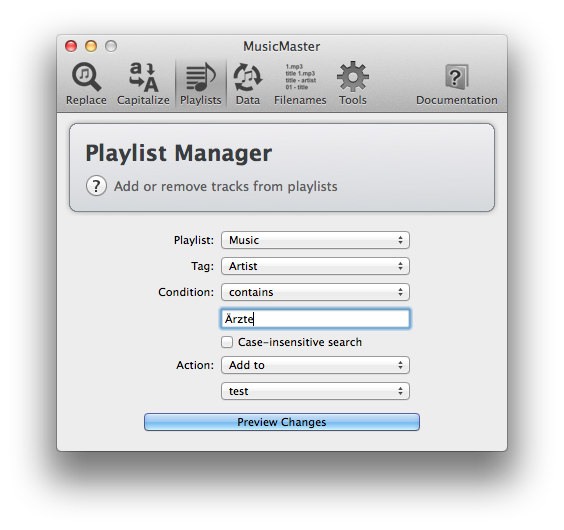 PLAYLIST MANAGER: The Playlist Manager allows you to add or remove songs from iTunes playlists. 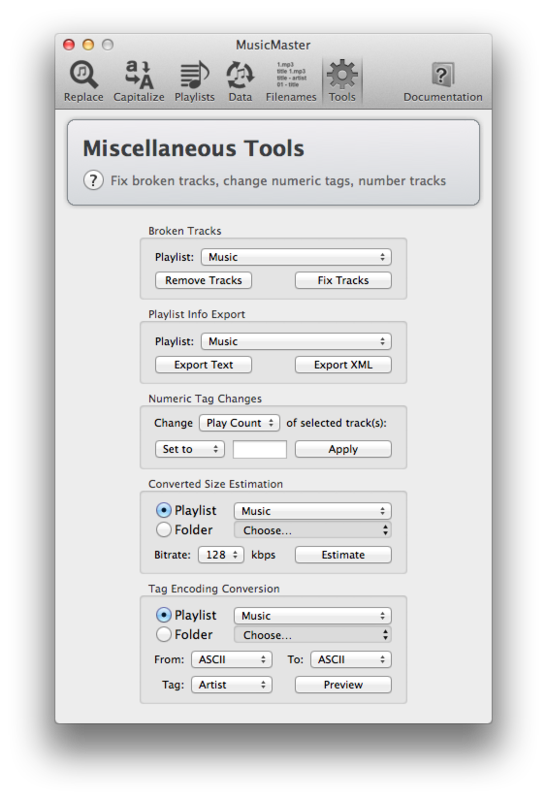 This is similar to creating a "Smart Playlist" in iTunes, but allows you operate on normal playlists and also allows to use more and more advanced criteria, e.g. you can add or remove all songs with empty lyrics to a playlist. 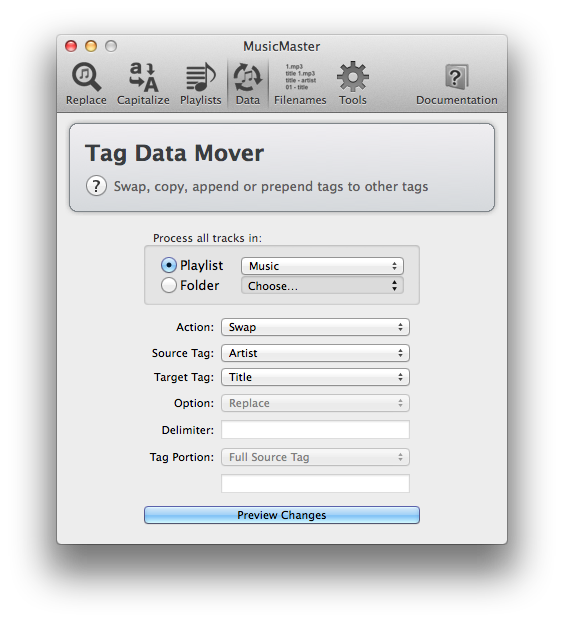 DATA MOVER: The "Data Mover" tools allows you swap tags with other tags or copy/prepend/append from one tag to another tag. The tool allows you to automatically repair the tags of files that have systematically been mis-tagged. NUMERIC TAG CHANGER: This allows you to change the numeric tags of your music tracks, like play count or rating of the tracks currently selected in iTunes. You can either set the tag to a specific numeric value, or subtract or add some numeric value (e.g. increase the play-count of files you've played elsewhere). MusicMaster is licensed under a proprietary license and costs 4.99$. Technical support is available only from within MusicMaster (in the "Help" menu).